The dismissal of Griffin’s plan reveals the struggles of the American architect. There’s a new plan for the University. After a disagreement erupted over the use of a piece of land “between the Medical School and the Oval”, the USyd Senate decides that something needs to be done. It’s 1914, and Walter Burley Griffin has just moved to Australia. Burley Griffin’s design had been selected as part of a design competition to plan a new capital city for Australia, and the new Federal Capital Director of Design and Construction had moved to Australia to facilitate the process, establishing offices in Sydney and Melbourne. Griffin had experience designing University campuses. In 1912, after securing the Federal Capital Director position, but before moving to Australia, Griffin was tasked with designing a plan for the 350-acre site of the University of New Mexico in Albuquerque. Griffin visited the site “en route” to Australia, and prepared plans from his Sydney office while the University sought funding for the project. Based on this experience, the USyd Senate chose Griffin for a new design for the growing Camperdown campus. It was to be Griffin’s first site plan in Australia after his design for Australia’s new capital. 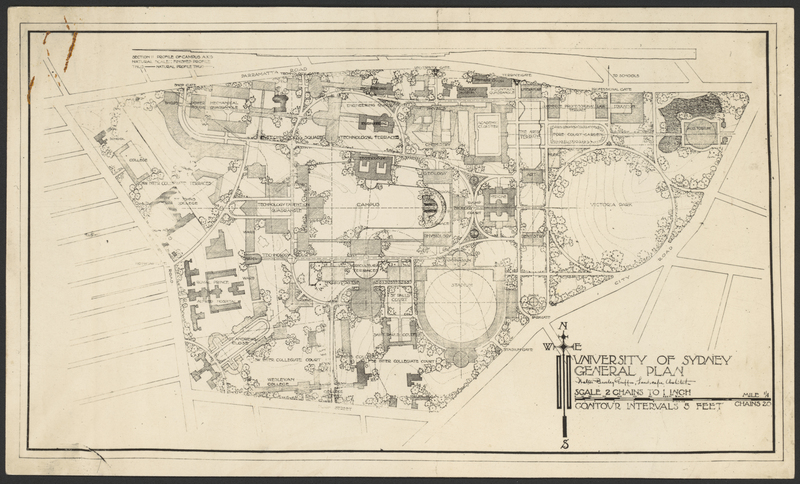 Griffin’s plan for USyd carried the same motif as his American one. Freely expanding lateral planes connected Terraces or Quadrangles organised by faculty. There is Technology Square, the Technology Terraces, Technology Court, and Technology Extension Quadrangle; Griffin predicted the University’s needs for an expansive Engineering & IT faculty. The Griffin vision for the Camperdown campus centres on three green areas. Victoria Park, ‘Campus’, an extensive space on the land partly occupied today by ‘the Square’, and ‘Stadium’, a large round sportsground, on the site of today’s St Paul’s College oval. The only space vacant from today’s campus, the Stadium featured extensive hemispheric grandstands no doubt modelled on something between a North-American ballpark and a European coliseum. His plan would have made the campus far more connected with surrounding suburbs, with the St John’s College gate on Parramatta Road forming the end of a long road sweeping all the way back to Eastern Avenue, and also connected to Missenden Road by a short westwards spur. But the biggest change by far was the designation of Eastern Avenue into two parallel avenues with buildings running between them. Griffin was tasked with planning for the future of the University as well, and it is without doubt that he planned for this space to be filled. Each of the paths were to be lined by a continuous wall of buildings; or in Griffin’s own words, “a compact continuous pueblo”. It was not a productive time for Griffin: simultaneously, the plan for the University of New Mexico faltered, described as a difficulty of “maintaining a practice across two continents” by biographer Alasdair McGregor. Soon after Griffin was commissioned by USyd, his “young assistant” based in Chicago, Barry Byrne, took over the Albuquerque site. Works on Griffin’s plans for Canberra were also slowing, being stalled by public servants who did not wish to construct the city under his design. Griffin was called before a Royal Commission into the design and construction of the city, occupying him for six months from July 1916 to February 1917. His brother-in-law reported that being investigated by the Royal Commission “made the practice of Architecture … very difficult” for Griffin. Griffin left the Canberra position, and found more success designing new Sydney suburbs such as Castlecrag, as well as Newman College at the University of Melbourne. Tying his university-designing career in perhaps what is quite a neat bow, Griffin was recruited to design a library for the University of Lucknow in India. He moved there in 1935, and died without the project being realised, two years later. Despite the rejection of his plan, Griffin’s influence at USyd lives on. The first Professor of Architecture, Leslie Wilkinson, based his 1920 campus master plan on “a series of formal axes around a central playing field and the… Physics school”, in arguably the same way as Griffin’s. Wilkinson’s plan was successful, but it was also largely ignored in principle as the University grew. It seems that no plan could predict the urgent bureaucracy as the growing needs of USyd students far outpaced any carefully considered architectural dreams. This article previously made reference to the ‘Fair Work Commission’ due to an error in reference materials. It has been corrected.